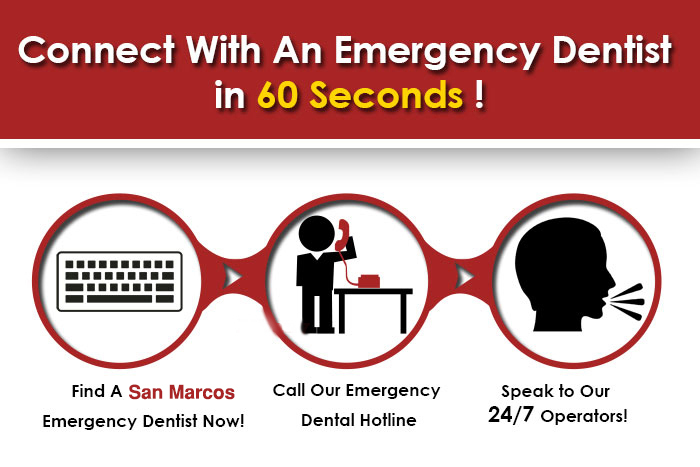 Welcome to the San Marcos emergency dentists section of Emergency Dentists USA. This is the #1 resource for finding an emergency dentist in San Marcos, CA. We promise if you follow our directions you’ll have an appointment with an urgent care dentist near you in no time. We offer you two ways of finding an after hours dentist. First we suggest you take advantage of our 24/7 referral service phone line listed at the top of the page. It’s 100% free to use and the operators will be able to find you the next available appointment with an emergency dentist and you don’t have to lift a finger! Finally, another option is to use our emergency dental clinic directory that we’ve put together below! This city in San Diego County lies just west of Escondido, and east of Carlsbad. Because of its favorable location near the Pacific, the temperature almost never gets above 90 degrees in the summer, or below 50 in the winter. This favorable climate is great for those that love warm weather and action sports, and only about 13 inches of rain a year falls here. Some of the area’s prime employers are Hunter Industries, the United Parcel Service, Oncore Manufacturing Services, Wal Mart, and Lusardi Construction Company. This city is known for having some of the best restaurants hands down in the county, and the “restaurant row” offers a very diverse array of cuisines. This is one of the areas of the nation where those who love biking and walking are ecstatic, because there are many here where you can see the entire view of the San Diego county. From many parks here you can even see the San Bernardino Mountains, and many who move here for this very favored weather and close proximity to the sea never want to leave. If you’re struggling to reach one of the many dental practitioners within our night dentist directory, we provide a phone line which acts as a referral service for after hours dental practitioners in your area, in this instance, San Marcos CA. Twenty-four hours a day, 7 days a week you’ll be able to get to the operators at our after hours dental telephone, just call today and get put into contact with a San Marcos urgent dental clinic. If you’re suffering from painful swelling or inflammation on your gums, tongue or cheek, we suggest you call to schedule a dental appointment soon. This could present itself as an abscess which can be a dangerous infection. It is advised to gently rinse the mouth 3-4 times a day with a light saltwater solution. This will help keep the wound sanitized and help prevent infection. You can also use a cold pack, or ice cubes inside a towel, to apply cold to the wounded area in order to decrease swelling and pain. You can expect an easy and quick answer for everyone being affected by any of the scenarios listed above. To find week end dental professionals we scoured the entries of emergency dentists in San Marcos and outlined only the dentists that we believe to have weekend or nighttime working hours. A niche market has developed supplying dental health treatment services to individuals in need of help. Office Our service of referrals to San Marcos dentistry clinics. Description: Dr Gerald W. Bailey: Grandon Village Dental is dedicated to improving smiles, providing cosmetic and orthodontic solutions, emergency dental services for any freak accidents you may incur, and having expertise in dealing with dental anxiety and fears. The entire team is able to keep you healthy in the long run, and regular cleanings, visits, and advice from Dr. Gerald will have you and your teeth happier than they have ever been. Description: Dr. Nirav Shah: Dr. Shah and the staff here at Dreamscape Dental want you to enjoy your next visit with their warm, friendly, and knowledgable staff: here you will find care that has been customized step-by-step for the entire family. Many folks have gum disease and don’t even realize it, each patient is evaluated, informed, and treated appropriately when it comes to this illness. Laser treatments, emergency services if something goes awry in your dental health, and sedation along with general dentist procedures are all performed here by the best and most skilled clinicians. Description: Nicole Miller, DDS: This practice takes a very refreshing approach to modern dentistry: they want to change the way people think about visiting the dentist, one smile at a time. Team leader Katie, patient care coordinator Stephanie, and registered dental hygienist Ashley all add their very valuable talents to this Mission Hills clinic, where everything from an after hours dentist issue such as a cracked tooth or routine check-up can be scheduled. Establishing a plan for the emergency dentistry visit is an important next step once you have made the decision which dental professional you are going to see. You might end up leaving the dentist office drowsy after the visit if you were put to sleep, so make sure you have a driver come with you. For those of you with dental insurance be sure to be aware prior to visiting the dental practice if he or she is going to take the insurance policy you may have. Consider what kinds of payment they’ll take in the office and be ready with one of these types. But make sure you get help should you suffer because oral pain can be exceptionally challenging to tolerate. Hopefully this has been a successful effort to discover an emergency dentist in San Marcos, CA and we could actually help! We advise you always do a qualifications check on the education and services promises of any dentist if you are visiting them the very first time, make sure you make use of San Marcos Chamber of Commerce Dentist Page. Other cities in the State of California.